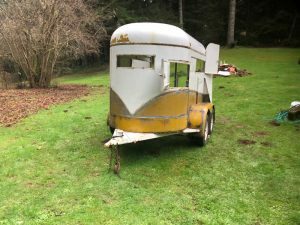 The trailer was hauled away and operation restoration was started in full effect. Everything in the inside that may have been soiled by horses was stripped out. The walls, floors, and excess metal were taken out. We were basically left with a metal box. Next was stripping, sanding, cleaning, and more sanding. SO. MUCH. SANDING. 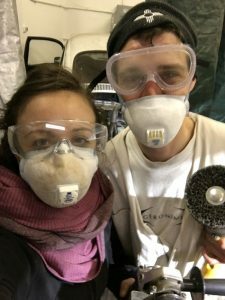 We had never anticipated that grinding away the paint would take so long. 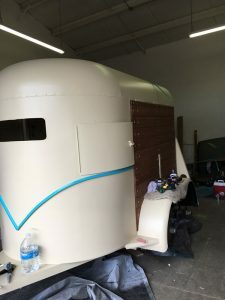 We joke that we thought it would take just a couple hours on a Saturday…and a month later we were still sanding all of the paint off. 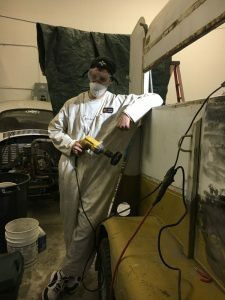 We worked our full time 8-5 jobs, got off work, drove 1.5 hours to the warehouse where the trailer was being kept, went to work sanding, cleaning, grinding, and sanding some more, and then drove back home to get ready for work the next day. We did this for almost a month. We knew that we were out of our minds but were so committed, excited, and energized by this crazy project that we couldn’t wait to get off work and keep grinding away at our dream. Before we started this project we didn’t own a single power tool in our house. Luckily with the help of so many talented and amazing friends and people in our community we were able to whip this little cutie out in about 4 months. 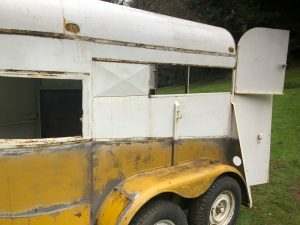 After we got the trailer down to bare metal our welder, Poncho, cut a hole in the side of the trailer for the window. He then custom fit a door that sat flush inside the hole and opens on hydraulic struts. The sound the service door makes when it opens is so satisfying! 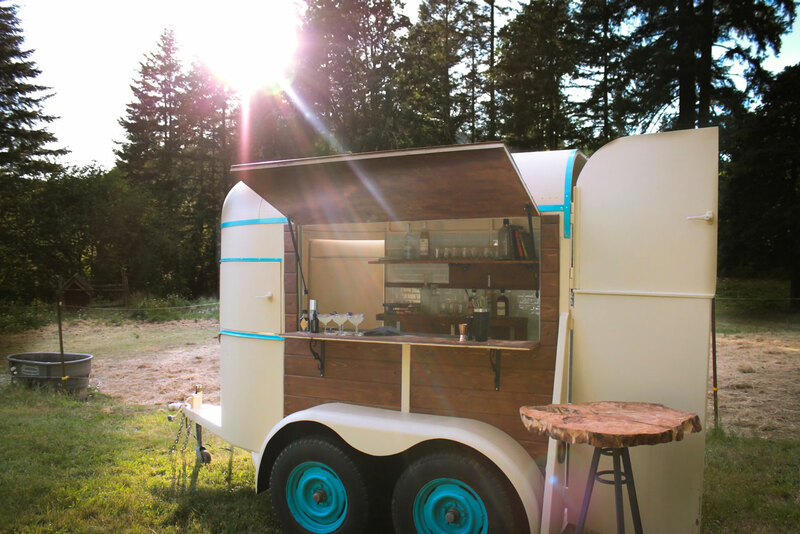 It finally felt like our horse trailer was becoming an actual mobile bar! The next step was to get this pretty lady painted! We are so grateful for all the superheroes that swept in and helped out to get the paint completed. We were approaching our deadline quickly and hadn’t expected that it would take a whole month to grind the paint off. We then had a woodworker, Mike, do all of the wood paneling and Rikki assisted and stained the wood. 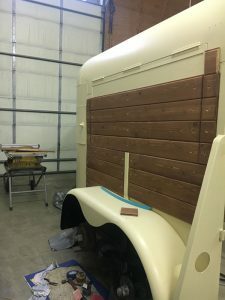 Each piece was cut to fit perfectly and since our old wonky trailer isn’t symmetrical each side was completely different. Mike and Rikki did such an amazing job! 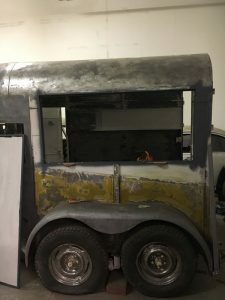 We painted the trim and pop riveted it back on. 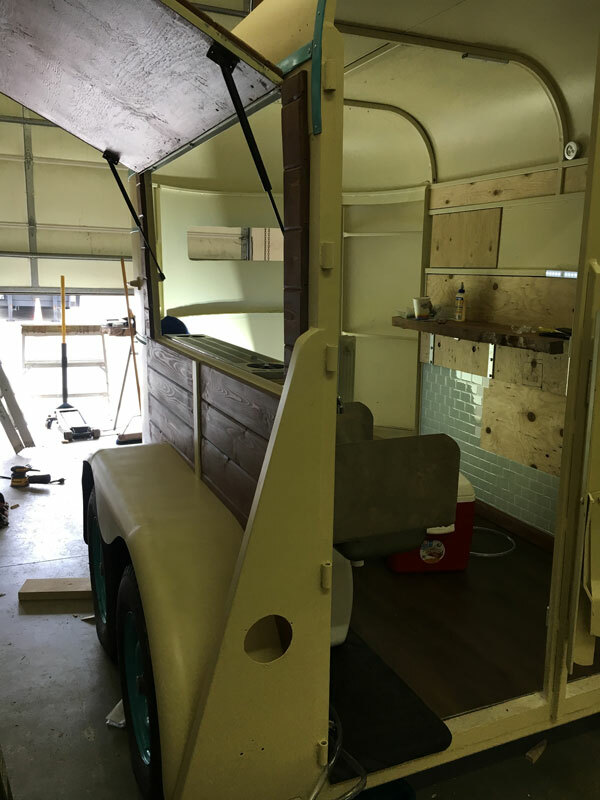 It’s finally starting to resemble a bar on wheels! Once all the trim was back on and the outside was complete we started to focus more on the inside. 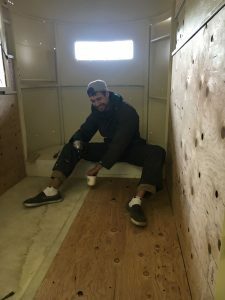 We put marine grade plywood in as a base layer for the floors. 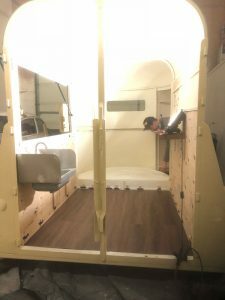 Once the base layer was in we added a snap together vinyl flooring. We then added in shelving and put in the water system. Danny and his dad worked together to install dual glass rinsers, running hot water, and a greywater system. We then finished the walls with blue subway tiles. It certainly wasn’t an easy project but it was so worth it. This is the version without all the sketching, planning, measuring, head-scratching, long conversations about logistics, and endless trips to the hardware store. It’s the version without the literal blood, sweat, and tears. We wouldn’t have it any other way. It connected us with so many different people. 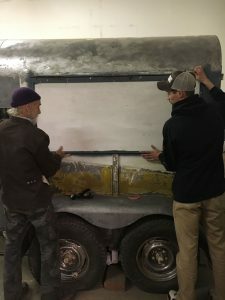 We are amazed and humbled that numerous people dropped what they were doing to help us reach our goals of transforming a vintage trailer into a mobile bar. After: The Tipsy Mule mobile bar is ready for service! 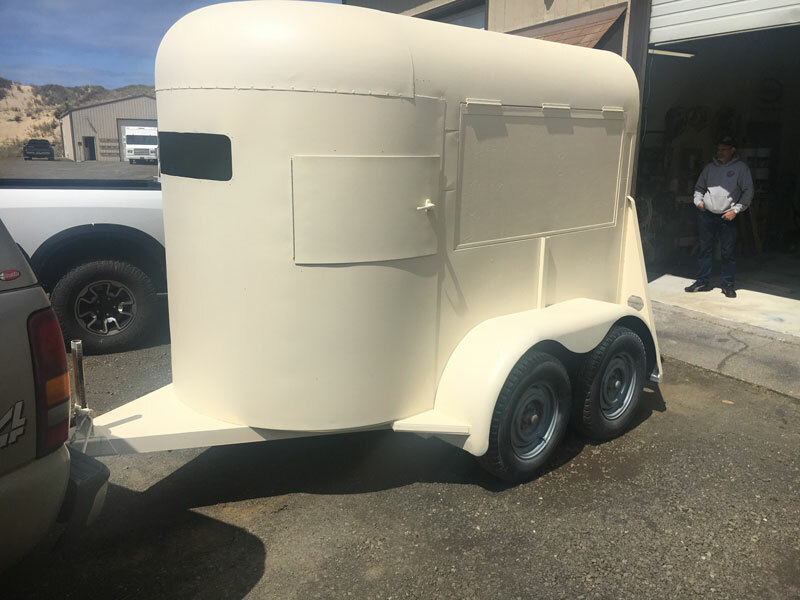 Now we have a completely functioning mobile bar service ready to provide cocktail catering to weddings and unions, private parties, and corporate events. We are located in Eugene, Oregon but service all of Lane County and Oregon. The mobile bar is fully functioning with hot running water and glass rinsers. Contact us to talk about your next event! We’ll roll up, make your space looks amazing, serve your guests, clean up, and roll back into the night again.